^ a b Groves, C.P. (2005). "GENUS Papio". In Wilson, D.E. ; Reeder, D.M. Mammal Species of the World: A Taxonomic and Geographic Reference (3rd ed.). Baltimore: Johns Hopkins University Press. pp. 166–167. ISBN 0-801-88221-4. OCLC 62265494. ^ Jolly, CJ (1993). "Species, subspecies, and baboon systematics". In WH Kimbel; LB Martin. Species, Species Concepts, and Primate Evolution. New York: Plenum Press. ^ Altmann, J.; Hausfater, G.; Altmann, S. A. (1988). 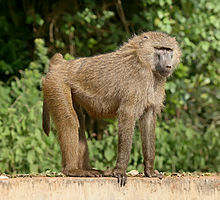 "Determinants of reproductive success in savannah baboons, Papio cynocephalus". In Clutton-Brock T. H. Reproductive success: studies of individual variation in contrasting breeding systems. Chicago (IL): University Chicago Press. pp. 403–418.